After my last post on the various costs of receiving weather information at sea, I received a couple of emails from people who thought I was overstating the amount of electricity required by the SSB in receive-only mode. That it should be possible to leave the SSB on receive for hours without draining the house battery excessively. 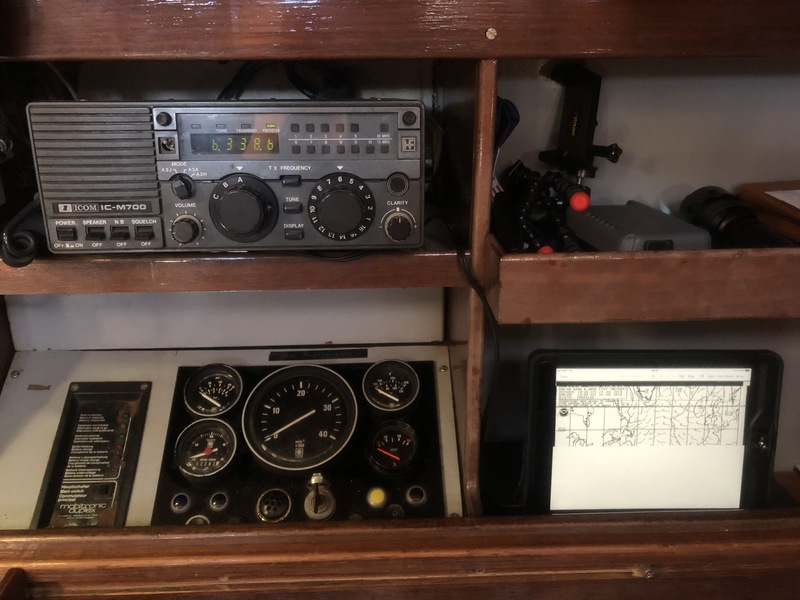 If so, that would enable me to receive weather faxes by SSB at least while anchored, or when I had the energy/time at sea to tend to the reception. That encouraged me to take another look at it, and to see whether they were correct -- at least with Petronella's specific combination of house batteries and solar panels. The first thing I tried (or re-tried) was using a system that was completely independent of P's house batteries. I could run this to my hearts content, and never use an electron that might be needed by the fridge, lights, fans, etc. Since it doesn't take use any electricity from P's house batteries, I call it my No-Power system, although clearly it does take some small amount of power, tapped from the Sun of course. The portable SSB is required to pluck the radio signals out of the air and convert them into sound waves. 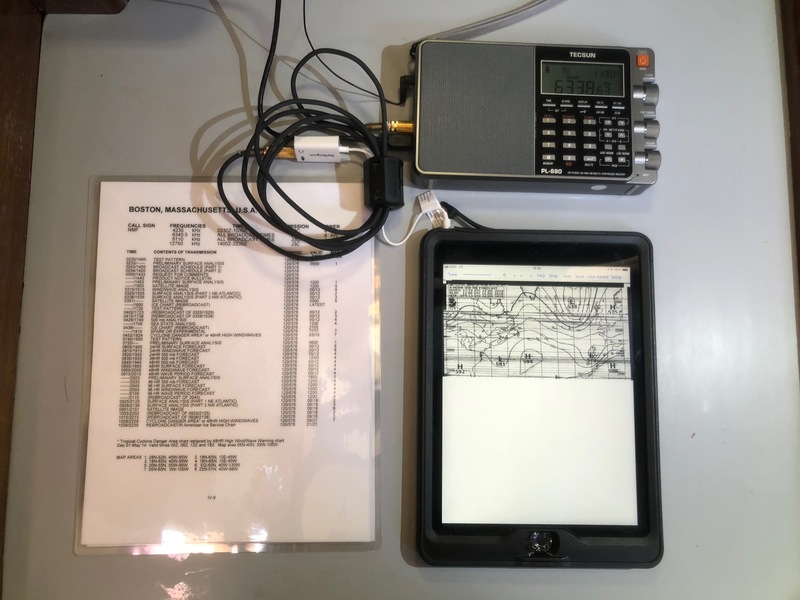 These sound waves are fed into the iPad and its HF FAX app, which convert the sound waves into images, and the optional printer is used to convert these images into actual hard-copy faxes. 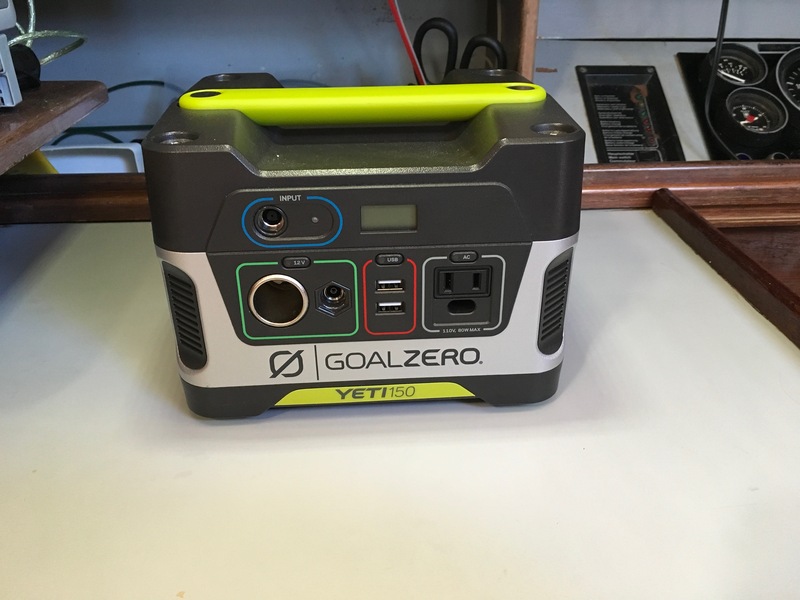 To keep it independent of the house batteries, I use a rather hefty portable power source, which has it's own solar panel to recharge it. 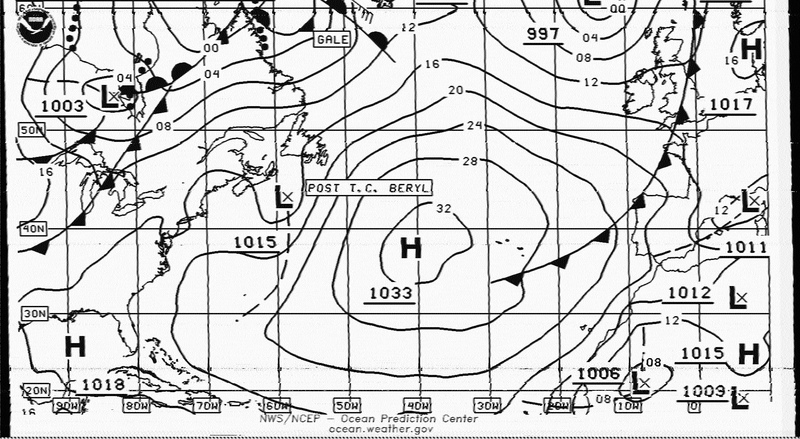 This system seems ideal except for one thing: so far, at least, it produces pretty lousy weather faxes. It is also a bit of a pain to use. I have to hoist a wire (usually up the mizzen mast) to use as an external antenna. This is always in the way, and so far, at least, the results are not great. I'm blaming the antenna at this point, since the radio itself seems high quality. I will continue to work on this system to improve the quality. Petronella's previous owners were very cautious about using the SSB, even in receive mode, and I guess I picked up the habit without thinking. However, during our restoration process, Helena and I replaced all of P's house batteries. I'd never even tried just leaving the SSB on to see if it drained the battery. I just assumed it would. After being chastised by a number of readers, I decided to put together this low-power system and to let it run for the two hours needed to download a complete set of Weather Faxes. This made me absurdly nervous -- I really didn't want to end up with a dead battery, warm fridge, etc. -- but all for nothing. At the end of the two hours, the battery still had a healthy charge. I wish I had measured the amp-hours used for this two hour period, but I didn't think of doing that until just now. Next time I try it, I will record the actual power used by the system. Warning: I performed this test on a sunny day in the Chesapeake, with both P's solar panels working to keep the house batteries charged. I have not yet tried this at night, or even on a cloudy day. A more modern, energy-efficient SSB would probably use even less power than P's ancient M-700. That said, the results were much improved. The fax below was received immediately after the one above, on the same frequency. That is, the received signal quality was the same for both faxes. Only the radio and antenna were different. Here is the Low Power system in action. 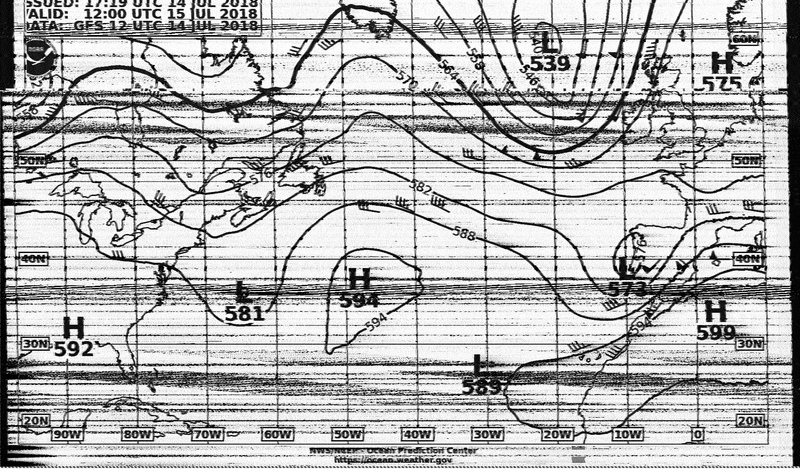 While it still takes more effort to receive weather faxes over SSB than to receive the same faxes via Satellite phone, and the quality is not quite as good, clearly my battery-energy argument was over-stated. It is clearly possible to build a low-power system that produces acceptable quality faxes without killing off the house battery -- and without using any high-cost satellite air time. It's also more fun than the sat phone. It's something of a challenge to get good results, and like anything you have to work for, more satisfying to accomplish. I will definitely be using one of these systems to receive weather faxes, whenever sailing conditions allow. Thanks to all who got me to take another look at this method. Good job and helpful analysis, consider writing an e-book on the topic. I bet if you put the "no power" system on the back stay, you'll get the same images. I’ve bee wondering the same thing. Will give it a try soon.